A compelling exhibition of traditional handcrafts of Mexico opens tomorrow, Saturday, August 18th, at the Lake Country Museum. The exhibition features a carefully chosen selection of glass, textiles, ceramics, woodwork, metal, and worked leather handcrafts dating from Pre-Columbian to contemporary times. Special to the exhibition are copies of ancient codices from Madrid and traditional costumes. The exhibition also includes an informative photography exposition featuring the portraits and stories of Mexican migrant workers in our community. September 5th through September 29th, 1 p.m. to 4 p.m., Mondays, Wednesdays and Saturdays. Admission to this exhibition is by donation. 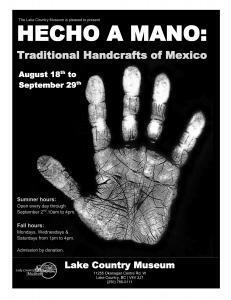 The Lake Country Museum is located at 11255 Okanagan Centre Road West, Lake Country BC. Phone 250-766-0111.